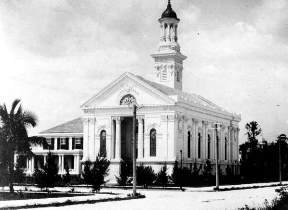 On April 1, 1896, the First Presbyterian Church became the first organized congregation in Miami. Although there is evidence that indicates a number of other organized church congregations prior to the First Presbyterian, this church was the first to organize in proximity of the incorporation of the city of Miami. The service on April 1 was conducted in a tent near the Miami River along Avenue D. Avenue D was later renamed Miami Avenue. Henry Flagler donated land and money to build a church in 1898. It stood at today’s Flagler Street and Third Avenue. Building of the church was completed in 1900. By 1947, First Presbyterian needed more space and decided to relocate to 609 Brickell Avenue. The new church on Brickell Avenue was completed in 1949 and the congregation has remained at this location in Brickell to this day. Figure 1: First church service tent in 1896. Courtesy of First Presybyterian Church. Figure 2: The First Presbyterian Church in 1903. Image courtesy of Florida Memory.